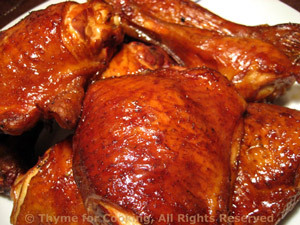 Thyme for Cooking Sunday Supper: Barbecued Chicken and Potato Salad. Summer isn't summer without barbecued chicken. A whole chicken will probably give you a few pieces leftover for lunch; or you can just get your favorite pieces. The barbecue sauce will keep for a week and we have other uses for it. The Bean and Potato Salad is for 2 meals. Bacon and cider vinegar add the traditional flavors of Hot German Potato Salad. 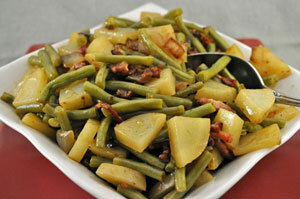 The green beans and celery round it out, making it a great accompaniment to grilled meats. Serve warm or room temp... Or even right from the fridge! Put a large saucepan, with a steamer basket inside and an inch of water, on the burner; medium - high heat. Slice potatoes - the long way, first in half, then in half again. Now slice (the short way) about 1/4 inch thick. We are aiming for bite size so if you have a huge potato, adjust accordingly. As you finish slicing add to the steamer basket. Top and tail beans and slice into 1 1/2" (4cm) pieces. Put on top of potatoes. Cover and cook for 10 - 15 minutes after water is boiling or until done. Stick a fork into a bean and a potato and taste to test. Remove from heat, uncover and set aside. In large nonstick skillet fry bacon, remove when crisp and pour off all but 1 tbs of fat. Add onions and celery, sauté until tender, about 10 minutes. Add stock, vinegar and bring to boil. Dissolve cornstarch in water and slowly stir into stock mixture, boiling until thick. Add cooked potatoes and beans stir gently to combine. Add bacon, crumbled, and stir gently. Put into a serving bowl. Serve hot, warm or room temperature.